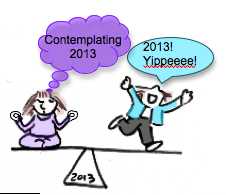 January 2013: A New Year! A New Blog! and a new website in the works! 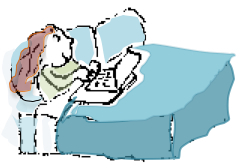 It is probably not news to you that many famous authors wrote from bed. Edith Wharton, Winston Churchill, Colette, and Mark Twain could all complete their fortune cookies with "between the sheets." And there just have to be at least five blog posts about writing in bed. (I checked...there are.) However, writing on a laptop, with pillows propped up around me is NOT the subject of this post. It's the "little lie down" on which I'd like to focus. This past December I was reminded, again and again, of all the good that co-exists with the miserable and broken in the world--but the deep sadness that began the month stayed with me and challenged any lighthearted feelings that tried to rise in the face of that sorrow. And as we all know, joyful is the catch phrase of our Decembers in the U.S. But trying to be joyful when you really aren't ...well that's a very tiring thing. And so I found myself needing to rest more, to take a moment and sit down or lie down or stare into space. And because it's really not all about me, as I sat, lay or stared, I started to think about the exhausting aspect of language learning and the days when a learner may just not feel up to it. Those of us who are energetic in our teaching style may not recognize that some learners are yearning for a quiet, restful time to contemplate the lesson content. In some cases, they may just need time to make the transition from their work day to the classroom.My classrooms are typically filled with teachers, but it's a parallel situation. 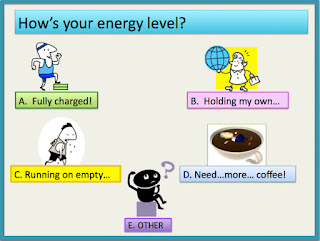 In fact, I often ask the participants in my workshops to rate and share their energy level with me, before they begin. If it turns out that a highly caffeinated person is sitting next to someone who has said her energy is at a low ebb, I implore the energized to be kind. In an effort to be kinder, I will use this month to try to strike a balance between the high energy of a new year and quiet, restful contemplation of what lies ahead. And then I'll try to bring that balance into my teaching... I'll let you know how it goes. Won't you do the same?